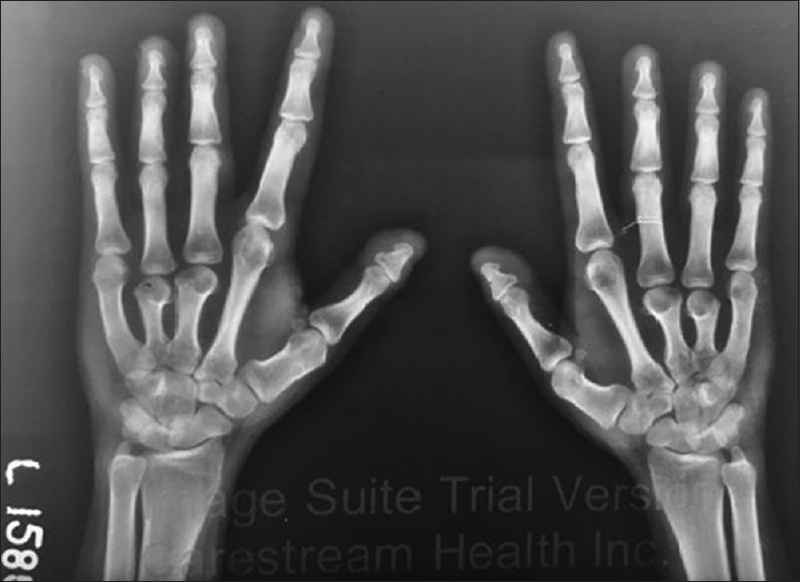 Albright's hereditary osteodystrophy (AHO) is characterised by short stature, varying degree of mental retardation, obesity with round facies, brachydactyly (i.e., shortening of the metacarpal bones, particularly the third, fourth and fifth) and dental hypoplasia. Pseudohypoparathyroidism (PHP) is a term used to describe the condition involving parathyroid hormone (PTH) resistance and is subclassified into 1a, 1b, 1c and Type 2. Although connected by a common gene defect, AHO and PHP are not interchangeable. These two conditions are heterogeneous manifestations of a defect caused by gene mutation in the GNAS gene, which may lead to the partial or total deficiency of Gsα activity. Impaired Gsα activity, in turn, causes disruption of the biochemical pathways responsible for the activation of various peptide hormone receptors. The GNAS gene itself is subject to 'genomic imprinting', a phenomenon that leads to gene expression in a parent-of-origin-specific manner. 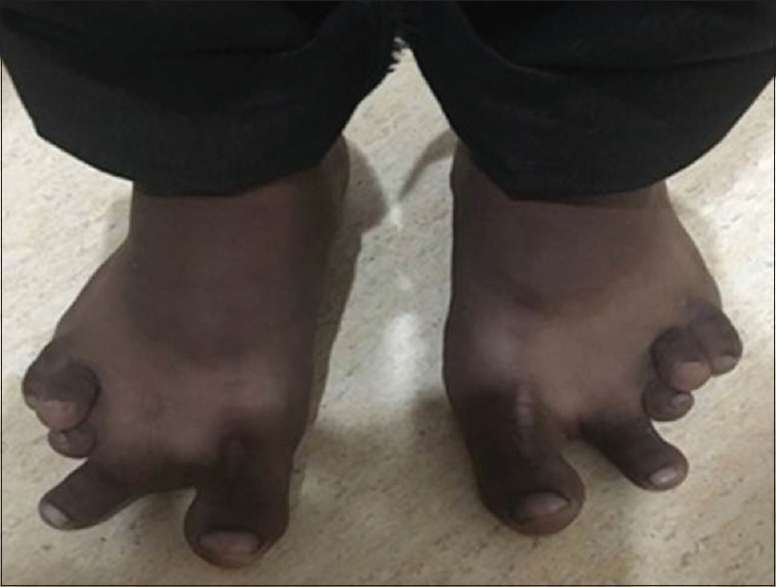 A 22-year-old male patient from Bangladesh presented with 'abnormal growth of fingers and toes' since childhood. He reported similar abnormalities in paternal great-grandmother. The patient was the only child to his parents. Accompanying him to the clinic, his father reports delayed intellectual and emotional maturity of his son compared to his peers (delayed academic progress - 11th grade at the age of 22). On examination, his height was 1.55 m and his weight was 55.5 kg. Examination of the external genitalia revealed bilaterally descended testes of about 8–10 mL in volume. His genitalia otherwise was fully virilised with normal male pattern pubic hair distribution. He had scant chest and axillary hair with no facial hair. Neurological examination was completely normal. 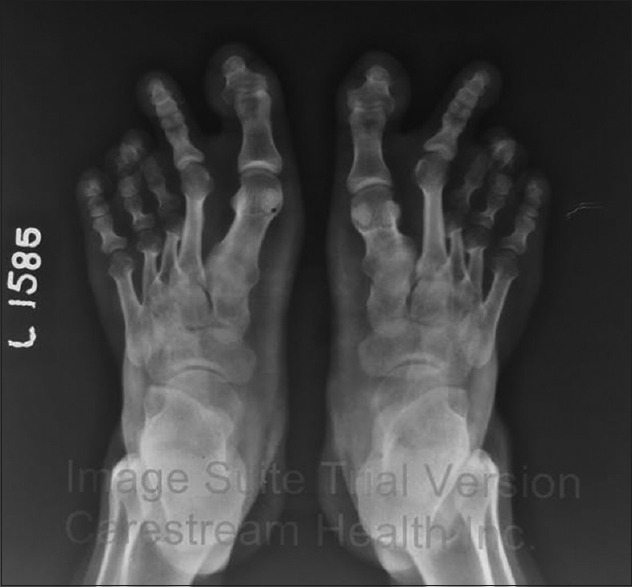 Archibald's sign (dimpled knuckles) and shortened toes typical of Albright's phenotypic features were prominent [Figure 1] and [Figure 2]. Laboratory investigations are listed in [Table 1], [Figure 3] and [Figure 4]. Computed tomography of the brain did not reveal any sellar abnormalities. He was diagnosed to have phenotypic features of AHO and pseudo-PHP (PPHP). Patients with AHO having GNAS mutations on maternally inherited alleles exhibit resistance to multiple hormones that use the alpha-subunit of the stimulatory G protein to enhance cyclic adenosine monophosphate (cAMP) production. Resistance to PTH manifests as hypocalcaemia and hyperphosphataemia in the presence of elevated serum PTH. In addition to PTH, resistance to many other hormones such as thyroid-stimulating hormone (TSH), gonadotrophins, adrenocorticotrophic hormone (ACTH), growth-hormone-releasing hormone and vasopressin are also well-recognised. This group of patients with resistance to actions of multiple hormones are classified to have PHP1a., On the other hand, patients with AHO having GNAS mutations on paternally-inherited alleles have the phenotypic features of AHO but manifest no resistance to hormones and are labelled as having 'PPHP'. The patient in our case exhibited clinical and radiological features of AHO with normal calcium, phosphorus and PTH result. Many patients with PHP 1a are well-recognised to present with overt or subclinical hypothyroidism in infancy, as a result of resistance to TSH action. The patient had mild biochemical hypothyroidism as evidenced by a small rise in TSH value and this is presumed to be due to primary hypothyroidism (subclinical) in the absence of proof of antibodies. Resistance to TSH is generally mild, with TSH levels that are only minimally elevated and thyroid hormone levels that are normal or slightly low as in our case. 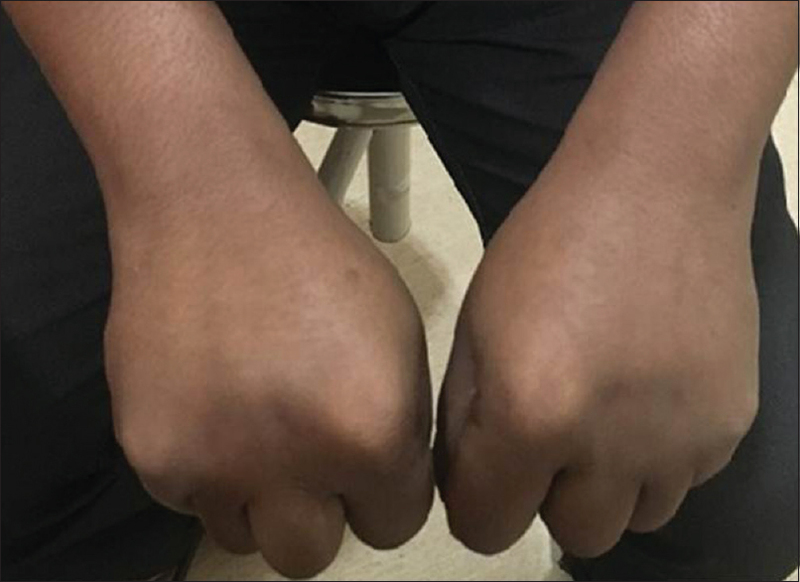 Partial TSH resistance in keeping with the GNAS mutation also remains a possibility with this patient given the clinical heterogeneity of this syndrome. Resistance to the actions of the gonadotropins with PHP 1a presenting with menstrual irregularities in women is well-recognised. This is thought to be due to a partial resistance of the theca and granulosa cells of the ovary to gonadotropins due to deficient Gsα activity. Hormonal evaluation in such women shows elevated gonadotropin levels with subnormal oestrogen. Patients with PHP-Ia (especially women), present with clinical evidence of hypogonadism. However, studies have not been able to consistently establish that they have increased basal or gonadotrophin hormone-releasing hormone stimulated levels of circulating gonadotropins. This is likely to be the cause of absence of gonadotropins elevation despite the low testicular volume in our patient. Unlike in women, such clinical and biochemical features with partial resistance are less well-identified and described in men. Nevertheless, patient in our case had hypogonadotropic hypogonadal biochemistry with bilaterally descended testes with post-pubertal volume (8–10 mL) and fully virilised genitalia that is classically not expected in patients with PHP1a. Given normal 17-OH-progesterone levels 30 min post-ACTH stimulus, late-onset congenital adrenal hyperplasia as a possibility to explain his virilisation is unlikely. In most patients with PHP1a, responses to corticotrophin and vasopressin are clinically unaffected. Interestingly, our patient has hypocortisolaemia as demonstrated by the subnormal response to exogenous ACTH. Only one such case in association with GNAS mutation has been reported in the published literature in the past. It is worth mentioning that ACTH acts through melanocortin-2 receptor whose second messenger is cAMP and the receptor acts through GSα. Thus, primary adrenal failure of unknown aetiology seems unlikely in our case. Overall, although our patient's phenotypic features resemble that of AHO, associated hormonal tests are not in keeping with classic presentation of PHP1a and hence PPHP is the primary diagnosis by exclusion. Nevertheless, clinical heterogeneity with variable expression of phenotypes, presenting with overlap between different subtypes, even amongst patients with the same GNAS mutation, is acknowledged to be a challenge in subtyping and classification of patients with this disease. Although genetic diagnosis could not be established in our patient, this well-recognised heterogeneity of GNAS mutations provides an opportunity for further study in patients like ours whose phenotypic presentation does not fit into well-defined subtypes of PHP. Further, hormone resistance in other axes may be present even when there is no PTH resistance in PPHP as illustrated in our case. We would like to acknowledge the Departments of Biochemistry and Radiology for their kind help in providing reports of the investigations mentioned in the case report and Dr C. V. Harinarayan, Director, Department of Endocrinology and Metabolic Bone Disease, Sakra World Hospital, Bengaluru, for input and discussions in this case. Thakker RV. Hypocalcaemic disorders, hypoparathyroidism, and pseudohypoparathyroidism. In: Wass JA, Stewart PM, Amiel SA, Davies MJ, editors. Oxford Textbook of Endocrinology and Diabetes. 2nd ed. Oxford: Oxford University Press; 2011. p. 675-86. Lietman SA, Goldfarb J, Desai N, Levine MA. Preimplantation genetic diagnosis for severe Albright hereditary osteodystrophy. J Clin Endocrinol Metab 2008;93:901-4. Peters J. The role of genomic imprinting in biology and disease: An expanding view. Nat Rev Genet 2014;15:517-30. Brickman AS, Carlson HE, Levin SR. Responses to glucagon infusion in pseudohypoparathyroidism. J Clin Endocrinol Metab 1986;63:1354-60. Weinstein LS, Liu J, Sakamoto A, Xie T, Chen M. Minireview: GNAS: Normal and abnormal functions. Endocrinology 2004;145:5459-64. Mantovani G. Clinical review: Pseudohypoparathyroidism: Diagnosis and treatment. J Clin Endocrinol Metab 2011;96:3020-30. Pohlenz J, Ahrens W, Hiort O. A new heterozygous mutation (L338N) in the human gsalpha (GNAS1) gene as a cause for congenital hypothyroidism in Albright's hereditary osteodystrophy. 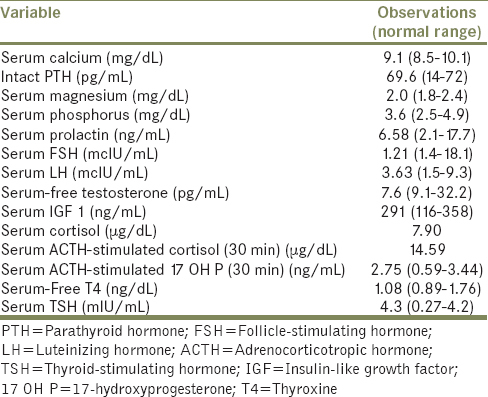 Eur J Endocrinol 2003;148:463-8. Namnoum AB, Merriam GR, Moses AM, Levine MA. Reproductive dysfunction in women with Albright's hereditary osteodystrophy. J Clin Endocrinol Metab 1998;83:824-9. Mantovani G, Maghnie M, Weber G, De Menis E, Brunelli V, Cappa M, et al. Growth hormone-releasing hormone resistance in pseudohypoparathyroidism type Ia: New evidence for imprinting of the gs alpha gene. J Clin Endocrinol Metab 2003;88:4070-4. Chaubey SK, Sangla KS. A sporadic case of pseudohypoparathyroidism type 1 and idiopathic primary adrenal insufficiency associated with a novel mutation in the GNAS1 gene. Endocr Pract 2014;20:e202-6. Lemos MC, Thakker RV. GNAS mutations in pseudohypoparathyroidism type 1a and related disorders. Hum Mutat 2015;36:11-9.